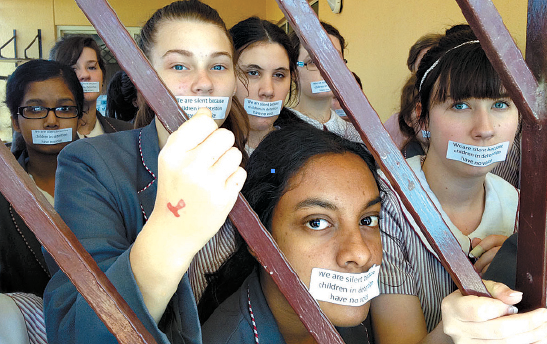 Silent voice: Mount Alvernia College students volunteering for lunchtime detention to bring awareness to detaining children in immigration detention centres. VOLUNTARY lunchtime detention has been embraced by a group of Year 10 Brisbane students to highlight the plight of children in Australia’s immigration detention centres. The students from Kedron’s Mount Alvernia College held the event Detention for Detention on three school days during National Migrant and Refugee Week from August 19 to 25. College mission and outreach deputy principal Alison Stone said volunteers “were to be ‘processed’ before entering a cage with their fellow ‘detainees’”. “All will be gagged to symbolise that children in immigration detention have no voice,” she said. “They will also write messages of support to these children, and letters to the prime minister and foreign minister. Archbishop Mark Coleridge of Brisbane was to be the main celebrant at the annual Archdiocesan Multicultural Mass in St Stephen’s Cathedral today at 2.30pm. The Australian Catholic Migrant and Refugee Office marked the week with the launch of its parish resource for the celebration. The theme this year was Migrations: Pilgrimage of Faith and Hope from the message of Pope Emeritus Benedict XVI for the 99th World Day of Migrants and Refugees. Australian Catholic Bishops Conference delegate for Migrants and Refugees Bishop Gerard Hanna said migration was “deeply linked with faith, and that this year’s parish resource reflects that”. “Faith and hope are inseparable in the hearts of many migrants, who deeply desire a better life and not infrequently try to leave behind the hopelessness of an unpromising future,” he said.